This went pretty good, and sound was recorded, but there was music in the background and Google flagged it for copyright reasons, so I had to remove the audio. Sorry. 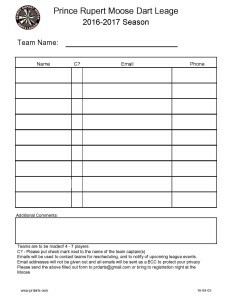 If you would like to fill out and/or submit your registration form before registration night, you can find it here and email it to me. 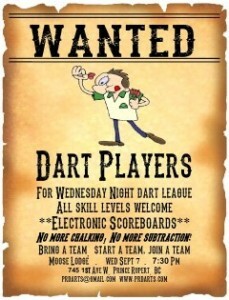 Steve has started a Facebook group called Prince Rupert Moose Dart League. It is with great sadness that we announce the passing of Joe at his home after a courageous battle with cancer. Joe, pre-deceased by his father Lloyd, will be lovingly remembered by his best friend and the love of his life, Annie, his wife of 31 years. 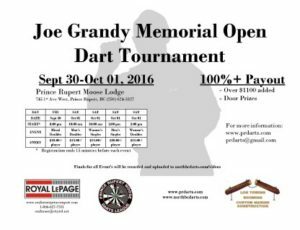 Also mourning his passing are his mother, 3 brothers, 4 sisters and their families in Harbour Breton, Newfoundland, where Joe was born. He will always be remembered by his 4 sisters-in-law, 2 brothers-in-law and his many loving nephews and nieces residing in Harbour Breton, NL and Prince Rupert, BC. Special thanks go out to everyone who walked with Joe on his journey, which includes family friends, Dr. Kloppers, Dr. Tse, Judy and Jennifer in the Oncology unit, the staff of the Prince Rupert Hospital, along with Joe’s Home Care nurses: Joan, Wanda and Amy. A celebration of Joe’s life will be held in Chances (downstairs) on Thursday, November 1, 2012, from 6:00 pm to 9:00 pm. In lieu of flowers, and if you wish, a donation to the Cancer Society in Joe’s name would be appreciated.